Heat a large Dutch oven or pot over medium high heat. Add oil. Add turkey, breaking up meat as it browns, about five minutes. Add vegetables – see note about chopping – and sauté until softened, about 5 minutes. Stir in spices, chili powder, cumin, and oregano and cook for one minute. Add tomatoes, paste, broth, and chipotle sauce. Stir to combine. Add lentils, chocolate and bourbon. Lower heat and simmer chili for at least 45 minutes and up to two hours adding liquid if needed. 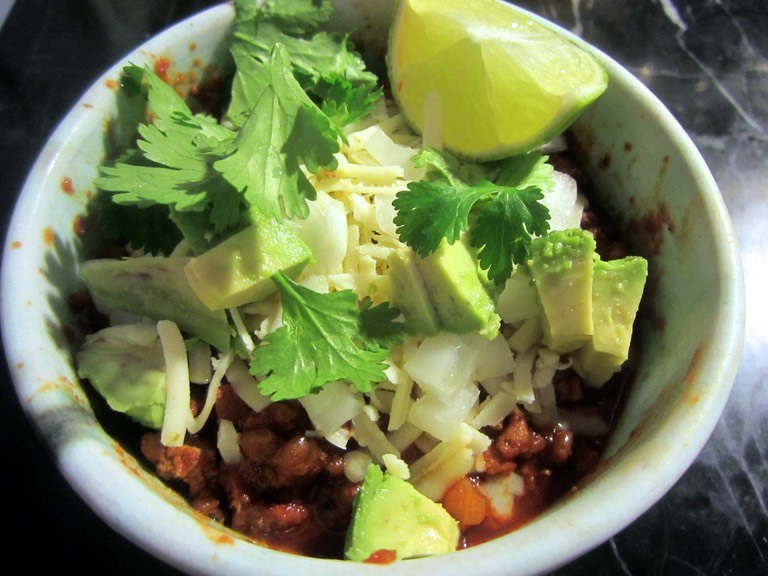 Serve with fresh cilantro, diced onion and avocado, sour cream, grated cheddar cheese, and a squirt of lime juice. Hot sauce on the side of course!